Modern tourist complex next to the Genovés park and by the sea, the Parador has impressive views of the sea and the Bay of Cádiz. 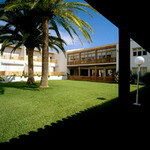 Located in a residential area surrounded by palm trees, it has exclusive access to a small beach. 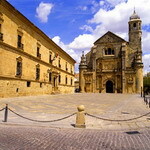 It is also a good starting point to discover the entire province (White Villages Route, Toro Route, Wine Route, etc. 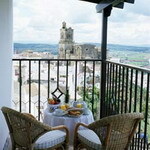 ), plus the small villages of the coast of Cádiz. The spacious, bright bedrooms, carefully decorated, have panoramic views, an invitation for peace and relaxation. Boat trips or excursions within the area are some of the activities that can be done outside of the Parador. Located on the ruins of the small summer palace of Abderramán I, a hill surrounded by vegetation at the foot of the Cordoba mountain range, the Parador offers an exceptional panoramic view of the legendary city of the caliphs. The building brims with freshness, as it enjoys a temperature 4ºC lower than in the city. 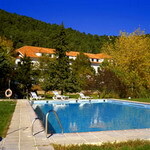 That feeling of well-being is enhanced by the swimming pool and the surrounding grounds (featuring a new garden known as 'Los Naranjos' ('The Orange Trees'), where the first palm trees planted in Europe maybe found. The inner rooms are elegant and very bright, with large living rooms and spacious bedrooms. 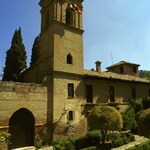 Spending a night in the gardens of the Alhambra, among fountains, trees and large arched windows is the exclusive opportunity offered by this Parador, a former convent built by decision of the Catholic Monarchs. This monumental ensemble proposes placid walks around the city for the guest, although the building itself invites you to discover a dreamlike interior, where Arabic and Christian styles mix. Its bedrooms offer exceptional views of the Generalife, the Secano gardens and the Albaicín, while the classical furniture and numerous portraits mark the decoration of the interior rooms. Under the coffered ceiling of the dining room and the freshness of the summer terrace 'gazpacho andaluz', 'tortilla de Sacromonte' and 'piononos de Santa Fe' are offered. 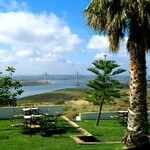 The dazzling Huelva sun lights up the blue course of the Guadiana, until it flows out into the waters of the Atlantic. 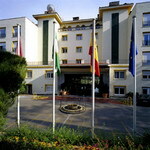 A peaceful refuge in the high quarters of the town, featuring panoramic views, the Parador is a quiet spot ideal for rest. The halls and rooms are fitted with modern facilities which are lit up by the Ayamonte sun and the simple shades of the decor, producing a feeling of calm. Fish, shellfish and all types of sausage are typical of the cuisine, which features ray-fish made with paprika, angler-fish in saffron sauce, pea stew with cuttlefish and Ayamonte-style galette. Located in the Doñana Environment Nature Reserve, the Parador rises up facing the ocean and next to the spacious Mazagón beach, in the middle of a pine wood. An ideal spot to enjoy nature and the blue waters of the Atlantic. 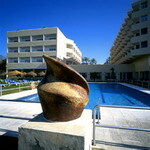 The building has a splendid garden with outdoor and heated pools, a gym, sauna and Jacuzzi among other features. The interior is characterized by pleasant and welcoming rooms with decorative details which bring joy and brightness. Cozy bedrooms with terraces and beautiful panoramic views, comfortable living rooms and a splendid swimming pool complete its facilities. The privileged location of the Parador on Santa Catalina Hill offers it the character of defensive bastion of the Jaén horizon. Origin and destination to discover the charm of the Andalusian Renaissance, the hotel has a refreshing swimming pool which, along with the exterior stone, offers protection from the burning sun which inundates the surroundings. The monumental appearance is maintained on the inside, where the impressive 20 m. high crossed arches of the main living room, the dining room, with a marked Arabic character, and the comfortable and friendly bedrooms with magnificent panoramic views stand out. 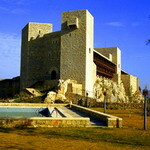 The Parador is located In the heart of the Cazorla Nature Reserve, in the spot known as Sacejo. Its height offers it unsurpassable panoramic views of the surroundings, in which hillsides covered with pine trees native to these mountains abound. The atmosphere of tranquility and beauty of enclaves like the Cañada de las Fuentes, or the 'Salto de Linarejos', makes it a meeting point for lovers of nature. The building revives the tradition of the typical Andalusian country house, which is a distinguishing feature of the exterior. Its swimming pool, with impressive views of the Nature Reserve, and the interior, with a pleasant living room with chimney, is characterized by the brightness offered by its large windows.